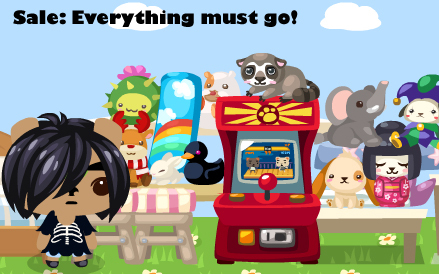 Pet Society Overdose – Are you at Risk? How I got hooked on P.S. I never realized that Hideeni, who looks even creepier than usual in his clown costume, eats and drinks. I discovered this today by accident when I tried to get my pet to drink some O.J. Hideeni instantly grabbed the juice and gulped it down. I got paid some coins for feeding him. Now, the logical question is, if Hideeni eats and drinks, does he poop as well??? 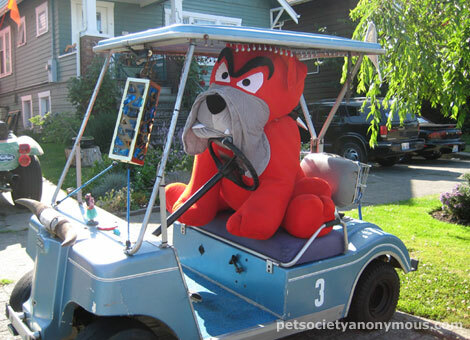 Real-life Pet Society moment: The first two pictures were taken in my neighborhood in Seattle. 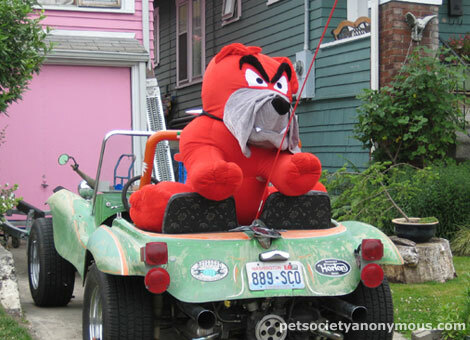 There’s a guy who lives in a pink house, who always has comical displays in his front yard. 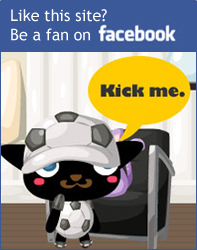 I’m not sure if he plays Pet Society, but I bet he’d like it, because he tries to turn his real world into a cartoon. 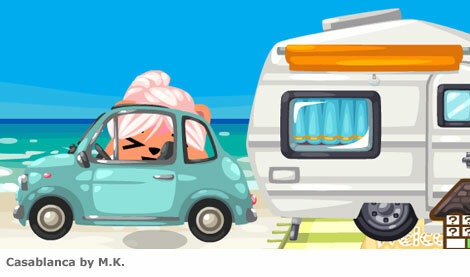 The last picture is from my Pet Society neighborhood, where MK has created a delightful camping-on-the-beach scene. Looks like her pet is having a blast! 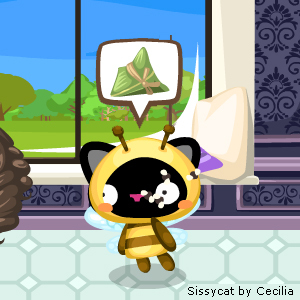 It’s Pet Society come to life! 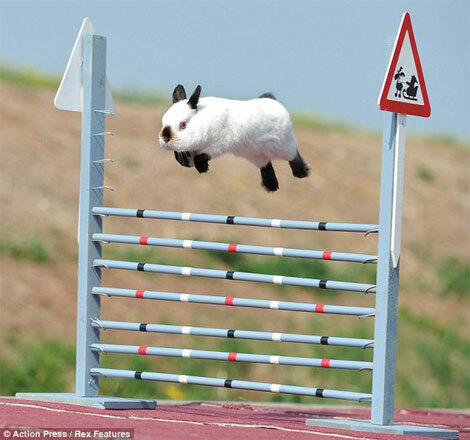 Real bunnies are being trained to race and jump hurdles. According to the MailOnline, this sport, which started in Sweden, is becoming a growing trend in Europe, US, Canada and Japan. 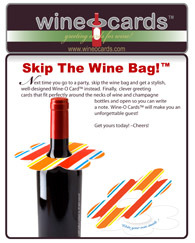 Thanks to Jacel for the tip! We think these are some funny bunnies! 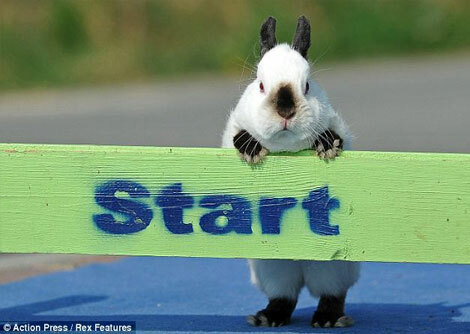 To see the full story on bunny races, visit MailOnline. 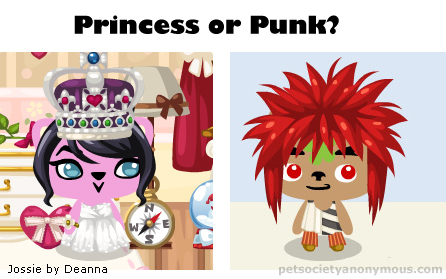 Princess or Punk in Pet Society? If you’re a princess, you would wear a crown. If you’re a punk, you could wear crazy red or blue wigs. A princess would be busy visiting other state officials. 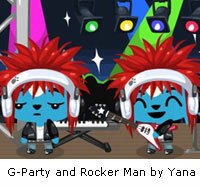 A punk would be busy partying late into the night. 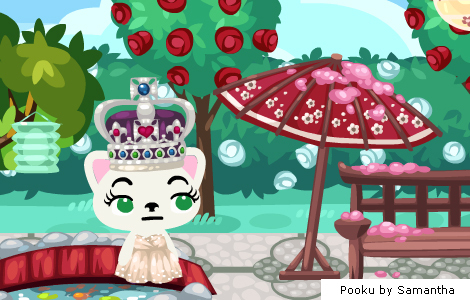 A princess would inherit the wealth of the king. A punk might have to sell his favorite things for money. A princess would be surrounded by body guards. A punk might be surrounded by poor friends who are hungry. Then again, if you’re a princess, it may be your responsibility to feed those who are hungry. If you’re a princess, you may never be alone. Yet, sometimes, you might feel very alone, because no one else can relate. So what would you prefer to be? Princess or punk? Noemi’s pet Luna has been working hard to squeeze out the new Easter-themed poos! The yellow duckling, carrot cake, and creamy egg poos look good enough to eat. Which one’s your favorite? Thank you to Snowball for giving Sushi his own set of the new poo! 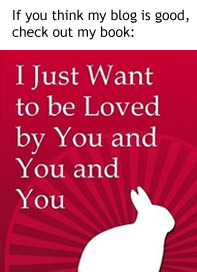 We love ’em! Doh! I made a big mistake when I tried to put in my squirrel home. In my last blog post, I said that it costs 10,000 coins to place it. 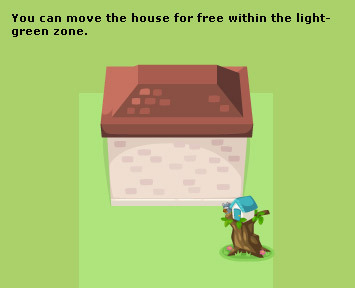 You can actually place it for free, as long as you stick to the light-green zone immediately surrounding the house. Anywhere outside it, you have to shell out some major coin. Thanks to readers for clueing me in! 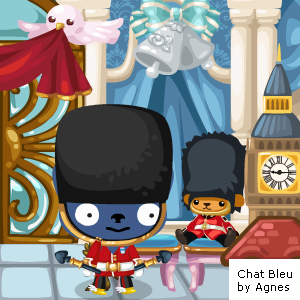 Another pet, Chat Bleu also points out that the house could be moved within this free zone as well. This gives you more options for decoration. 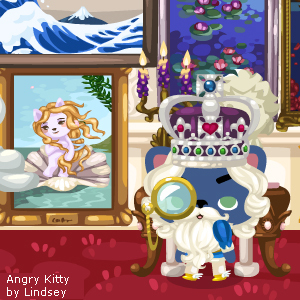 Don’t forget to take advantage of the free gifts that Pet Society is offering this week. 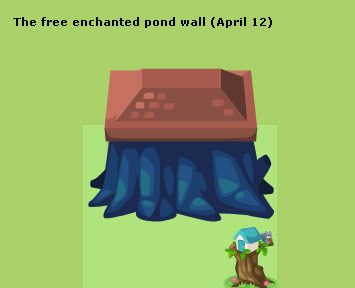 Today, April 12, you can get a free Enchanted Pond Wall to make a charming abode. 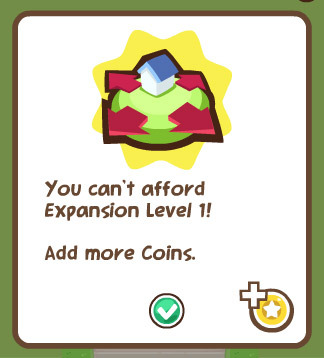 So I clicked on the “Expand” button, but realized I couldn’t afford it. 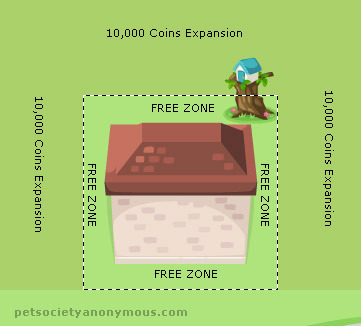 Expanding a yard costs 10,000 coins! 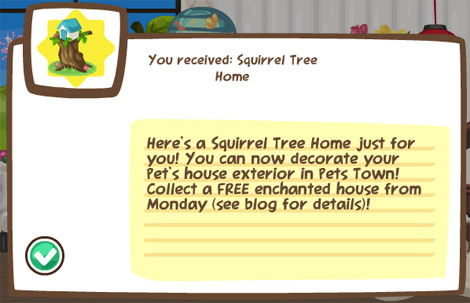 I don’t like to complain, but this free squirrel home doesn’t seem like a great offer any more. It looks like a scheme to get players to buy more coins. For now, my squirrels will remain homeless. 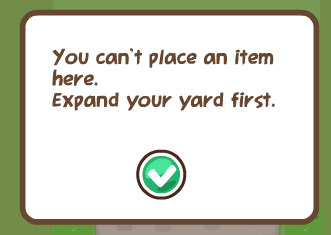 I’m not sure if I will go through the trouble to earn 10,000 coins and expand the yard. Will you? 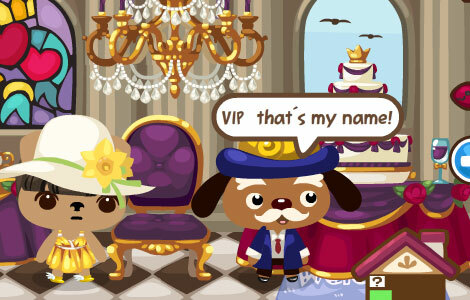 Got a great Pet Society story of your own? Post story and images on facebook.com/petsocietyanonymous. The best stories will be posted on this blog! Pet Society Anonymous by Soyon Im is licensed under a Creative Commons Attribution-Noncommercial-No Derivative Works 3.0 United States License. Based on a work at petsocietyanonymous.com. Permissions beyond the scope of this license may be available at http://petsocietyanonymous.com.